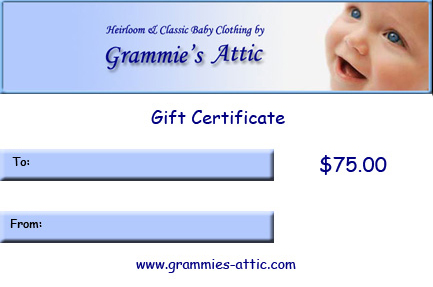 Give the perfect baby gift -- a Grammie's Attic Gift Certificate for $75. Just select the format you prefer, enter the recipient's name and email address (for emailed Gift Certificate) and the giver's name and your shopping worries are over! If you'd like the gift certificate to be mailed to the recipient, you can enter the shipping address at checkout. 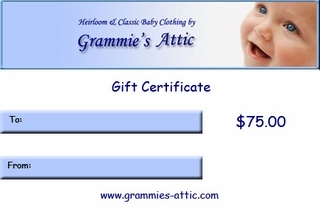 If you'd prefer that the Gift Certificate be mailed to you so that you can present it personally, leave the recipient's email address box above empty. If you'd like a personal message to be included, you can add that to the gift message box at checkout.